The latter response is one that BarberSoc’s female-range group, Pitch Please, is well aware of, incorporating the yellow scarves of the Barden Bella’s uniforms into their own, and covering Party in the USA as a nod to the film. 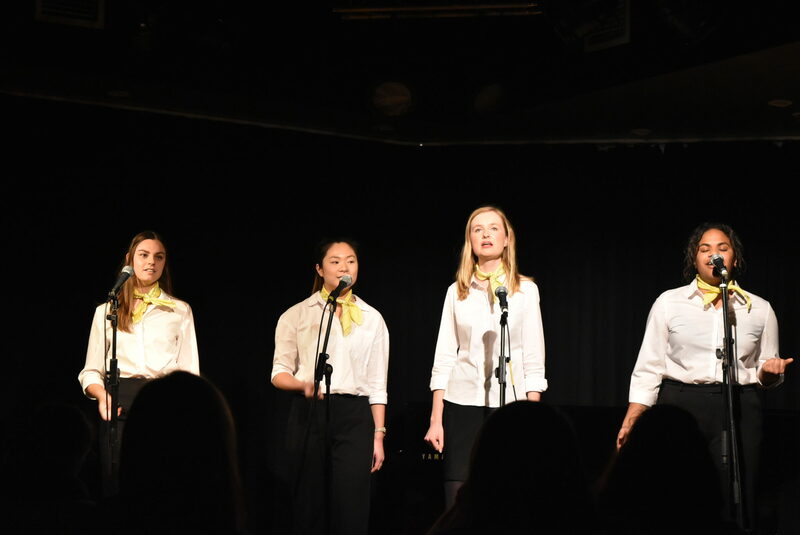 In their cover of Girls Just Wanna Have Fun, the group was lively and engaging, and their genuine passion about singing was evident to the audience. Their repertoire ranged from Irish folk music to Billy Joel’s The Longest Time, though the latter could’ve benefited from the warmth offered by lower vocal ranges and more precise high notes. Nevertheless, the group embodied the spirit of the night: lighthearted and earnest. This was echoed in BarberSoc’s male-range group, Duly Noted, which made up for sometimes imperfect harmonies with stage presence and charisma. The most memorable cover from the night was their rendition of I take a look at my enormous (complete the sentence), replete with an imitated saxophone and scatting solo – very entertaining, if not a little too on-the-nose for an all male group. Duly Noted used the group’s impressive vocal range to its fullest, as their bass part interjected with a deep, melodic bar, before finishing off their cover of Istanbul with an impressively sustained high note. For all the entertainment that the performing groups provided, some pieces suffered from pitching issues, especially faster songs with quick, staccato notes that required tonal and rhythmic precision. Some arrangements could have achieved more cohesion with a more unified tone – the contrast between breathy singers and those with richer or brighter tones was a little jarring. BarberSoc’s last group, the mixed voice The Accidentals, managed to mitigate this problem the most as their relatively large size muffled individual mistakes and created an impressively impactful wall of sound. The large size of the group did mean that the harmonies sometimes lacked coherence, but despite this, they maintained great volume dynamics, shifting from loud to soft with practiced ease in their cover of Kiss from a Rose. The highlight of the night was a cover of Beautiful by all the groups, featuring a heart-wrenching solo from Larisse Moran whose riffs had the audience cheering. Ultimately, BarberSoc’s recital fulfilled exactly what it set out to: an entertaining and frenetic performance that was never once boring, or inaccessible. Solo performances across the groups showcased some serious singing ability. The covers ranged widely and kept the show refreshing, moving from pop song to slow ballad to a spirited rendition of Rasputin, capped off at the end of the night with a deeply satisfying cover of Teenage Dirtbag. As the singers danced on stage, it was apparent how much fun they were having, and that honest, sincere celebration of music is what made BarberSoc: Tonal Recall an enjoyable and gratifying show.